Cornish Pirates boss Ian Davies hailed his side after they came back from 21-10 down at half-time to beat Bedford 32-31 in the Championship. Alex Cheesman's last-minute try and Laurence May's conversion saw the Pirates achieve just their third league win of the season. "It's a huge victory," Davies told BBC Radio Cornwall. "The first half was poor and Bedford fully deserved to be ahead, so a fantastic effort in the second half." 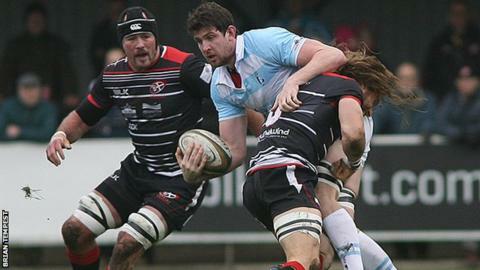 The victory moved the Pirates off the bottom of the Championship and up to 10th place in the second tier of English rugby. Tries from Patrick Tapley, Tom Griffiths and former Pirates loanee Joel Conlan helped put Bedford out in front, while Jack Arnott crossed for the home side. But after the break Canada international Matt Evans scored twice and Pirates captain and compatriot Aaron Carpenter added another to help cancel out Michael Le Bourgeois' second-half try. With the Pirates trailing 25-31 Cheesman went over before May converted for the bonus-point win. "That second half was fantastic, we've come back from the brink," added Davies. "I was waiting to come on here and say 'we've been hammered', but that was a phenomenal second half and we fully deserved the win."